Arthropod animals were moulting to make room for growth more than 500 million years ago, fossil evidence confirms. Scientists have long believed these creatures shed their hard, outer layers, just like their modern counterparts - such as insects - do today. Now, the journal Nature reports the discovery of the first fossilised creature to actually be caught in the act of shedding its exoskeleton. The Cambrian arthropod was found in the famous Burgess Shale, Canada. Exoskeletons are the most common body arrangement among Earth's animals. Insects, spiders and crustaceans have them, while mammals, birds and fish have endoskeletons. An exoskeleton provides a hard casing that offers some protection from predators. But there is a downside: it does not allow the body to expand. If an animal sporting an exoskeleton wants to grow, it must dump it temporarily before forming another, in a larger size. Scientists have suspected that the strategy of moulting (ecdysis) has been around since the first arthropod - about 545 million years ago - or even longer. They have been supported in this belief by circumstantial evidence. 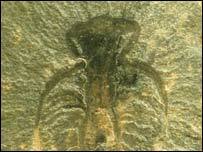 For example, a few fossil trilobite specimens were found in what looked like a post-moult state. But until now, there was no direct proof that Cambrian arthropods moulted. The specimen that cleared the matter up - a 505-million-year-old creature known as Marrella splendens - was perfectly preserved in mid-ecdysis. It is described in Nature by researchers Diego García-Bellido and Desmond Collins. "The discovery of an arthropod in the act of moulting was exciting because it was so unexpected," Dr Collins, from the Royal Ontario Museum, Canada, told BBC News Online. "Working with trilobites and other extinct arthropods, we saw some specimens that we thought could have been moults - but you could never be sure. With this specimen you could be sure." There are two main reasons why the fossil record has, until now, been reluctant to provide such evidence. Firstly, a creature in moult has a soft body, which does not preserve easily - the conditions have to be just right. And secondly, the process of moulting is usually very quick, meaning the "window of fossil opportunity" is small. "The likelihood of capturing such an event is so astronomically small," Dr Collins said. "Similar moulting events in living arthropods, such as larval lobsters, take less than 10 minutes. "You would only find it in a large sample - 25,000 Marrella specimens have been collected so far - in a fossil assemblage that preserves soft-bodied animals. "Luckily, the Middle Cambrian Burgess Shale of British Columbia is the soft-bodied fossil assemblage."